Solar power for residential houses is one of the most interesting topics for home owners in Cape Town. We are one of the leading companies for residential Solar Systems in Cape Town and the Western Cape. Our installed capacity in the residential sector is over 600kWp, supported by more than 1700kWh of Battery Storage. Design your own residential grid-tied Solar System. We have built an awesome Design tool for you, to let YOU design your own Photovoltaic System for your home. This type of PV system needs a permanent connection to the grid. It will supply electricity to all loads, when the sun is shining. The produced Solar Electricity of a grid-tied Solar System can´t be stored. However, some municipalities, like Cape Town, have implemented a SSEG tariff, allowing you to feed your surplus Solar Electricity back into public the grid. This System is the basic form of utilizing Solar Power and brings financial benefit to you, by offsetting your electricity bill. Especially for Residential Solar Systems it is recommended to include an additional backup component to this system. A grid-tied Solar System is the best choice, when your main electricity consumption occurs during daytime. You will consume less electricity from your municipal supply and might even qualify for SSEG. Especially businesses profit from this Renewable Power System. However, if you don´t qualify for SSEG and your Solar Power Production exceeds your consumptions, your Solar System will have to be throttled. Our grid-interactive or Solar Battery Systems incorporate the public grid into the Renewable Energy Supply of your house. These systems are our specialty and our most common type of installations, out of all Residential Solar Systems. The Battery enables you to store your Solar Electricity for night time and power outages, like load-shedding. The change-over during a power failure is seamless, so that all your appliances remain switched on. 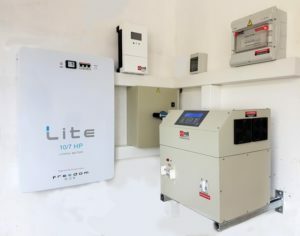 Since the uplift of Lithium Batteries and our strong partnership with FreedomWon, we focus our grid-interactive Solar Systems around Lithium batteries. It enables us to provide compact systems with outstanding reliability and highest efficiencies. The performance of our Lithium batteries is 50% higher, compared to the old lead-acid technologies. Adding a Lithium Battery to your Residential Solar Systems will increase your self-consumption of Solar Electricity to over 90%. Going “off-grid” is a frequent request. We would love to help you through this process. With detailed measuring beforehand we will provide you with recommendations for electricity savings and habit changes, because going off the grid is not only a matter of equipment. An off-grid PV System has virtually no connection to the public grid at all. If your inverter has a connection to the public grid, the correct term is a grid-interactive or Solar Battery System. This becomes very important, if you are dealing with your municipality concerning your SSEG application. If you live in a remote off-grid area or want to have a portable and robust off-grid Solar Solution, have a look at The Sunplug, our self-developed and engineered “plug-and-play” off-grid Solar System. Micro-grids are a rather complex version of Residential Solar Systems. They incorporate different sources of power, which are managed through a external control system. Furthermore, it is possible to set up several Residential Solar Systems together, as a decentralized micro-grid. The main controller then directs surplus power of one house to other houses, where power is currently needed. Setting up a micro-grid is a complex task and requires in-depth planning, engineering and consulting. Please leave your details and we will engage this exciting topic together. Interested in Residential Solar Systems in Cape Town and South Africa? Then please contact us on our website, write an e-mail, phone or visit us. We look forward to getting to know you and help you with your Energy Independence! Our Solar Systems for Businesses might also be of interest to you!